Monthly disposable contacts designed for napping and sleeping up to 30 days. (FDA approved). These contact lenses have the innovative AQUA moisture system all day, everyday, even over night. It allows the most oxygen through the lens then any other available soft contact lens. Are you tired of having to change your contacts daily? With Air Optix Day and Night you can function as if you’re not wearing contacts at all because it is specially designed and FDA approved for napping and sleeping. You don’t have to worry about the drops either because it has an AQUA moisture system that keeps your eyes from drying all day long. 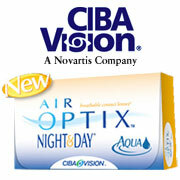 Purchase Air Optix Day and Night right here at cococontacts.com. Do you work long hours or have a non stop schedule? Ever get so worn out that you fall asleep wearing your contact lenses one night? If you're a student, a new mom, a business traveler or just have a busy life that keeps you on the go day in and day out then Air Optix Day and Night may be right for you.